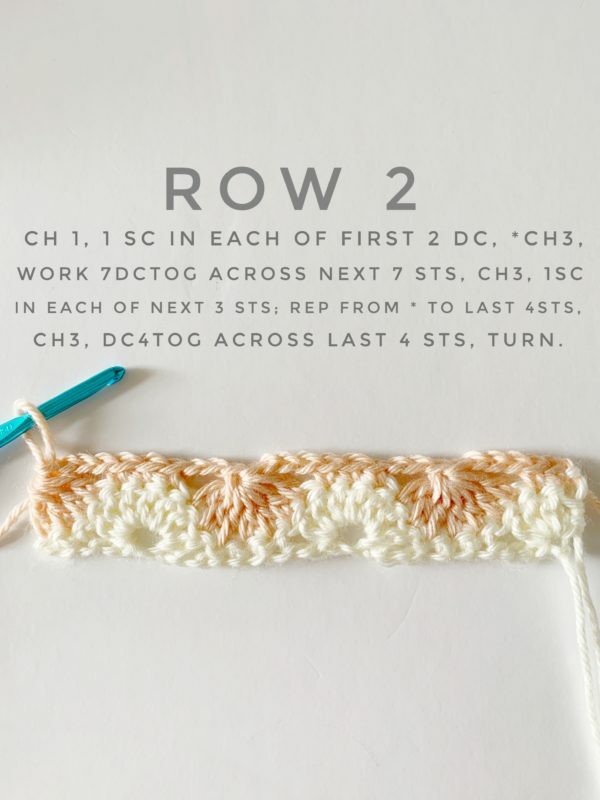 The Catherine’s Wheel stitch is a crochet classic! I rate it intermediate but don’t be shy of a challenge, just be patient with yourself and practice before using it in a project. I’m using Caron Simply Soft in light country peach and off-white for this sample with an H-5.00mm hook. Scroll to the end of the post if you want to skip straight to video instruction. Start with 27 chains. Pattern repeat is 10 + 6 + 1. That means you can make a chain any multiple of 10, then add 6, then add one for the turning chain. ROW 3: CH 3, 3 DC in first stitch, (turning chain counts a DC). *Skip 3 CH, 1 SC in each of the next 3 SC. SK 3 CH, 7 DC in the loop that closed the 7dctog, Repeat from * and end by skipping 3 CH, work 1 SC in each of the last 2 SC. Turn. ROW 4: CH 3, DC3tog across the next 3 stitches, *CH 3, 1 SC in each of the next 3 stitches, CH 3, 7DCtog across the next 7 stitches, repeat from * to the ending 2 stitches. CH 3, 1 SC in last stitch, 1 SC in the top of the turning chain. Turn. CH 1, 1 SC in each of the next 2 SC. *SKip 3 chains, 7 DC in closed loop of the 7dctog. Skip 3 chains, 1 SC in each of the next 3 SC. Repeat from * to the end, skip over the last 3 chains and work 4DC into the top of the turning chain from the row below. Turn. Repeat rows 2-5 for the pattern to continue. And, change colors however you wish! Video demonstration is available, watch below, or watch on YouTube. 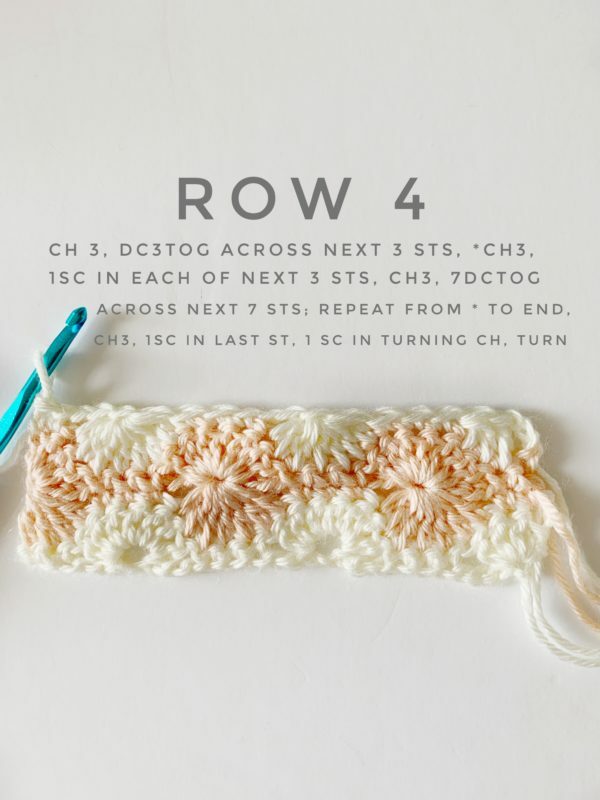 Thank you for stopping by to learn a new stitch! I have more! Click here to see all the stitches in our Daisy Farm library.